This is hard picture puzzle to find something wrong in this image. This image is taken from Yukon Solitaire Card Game. There is something wrong in this puzzle picture. Can you find what is wrong with this picture? Can you find what is wrong with this picture? 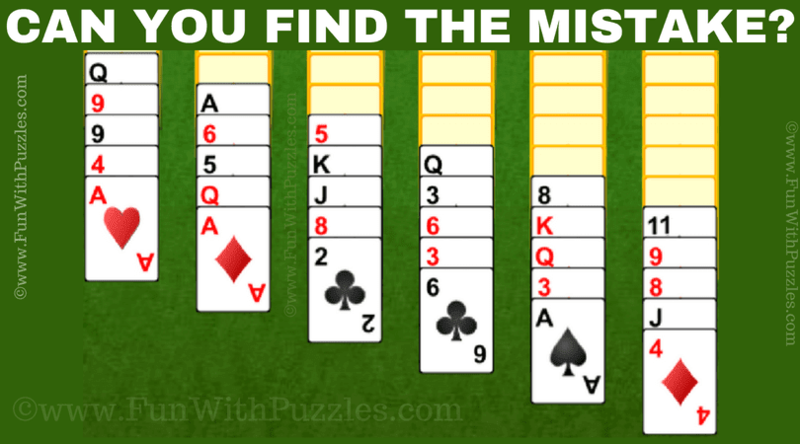 Answer of this "What is Wrong with this Picture Puzzle", can be viewed by clicking on button. Please do give your best try before looking at the answer. Check Out What's Wrong in this Picture? It takes luck and great observation skills to solve this picture puzzle. Do checkout below mentioned puzzles and brain teasers to test your analytic and logical reasoning. 1. Reading Brain Teasers to Train your Brain: These are the brain teasers which will test your observation skills. In these brain teasers your challenge is to read the given text. These brain teasers are designed to train your brain for better visual perception. 2. Mind Blowing Maths Circle Questions with answers: If you like to solve Maths Puzzles, then try out these Mind Blow Maths Circle Questions in which your task is to find the missing number which will replace the question mark. 3. Japanese Ship Murder Mystery Puzzle: Now it's time to play detective as you have to solve a Murder case which happened on the Japanese Ship. 4. Moving Pictures Optical Illusions to trick your brain: At the end its time to trick your brain using optical illusions. Can you tell whether these optical illusions are stationary or moving?